The latest Horizon Report for higher education has arrived. As always, I think the report should begin by reviewing previous editions of the reports and identifying corrections to its methodology that will improve projections. Or at the very least there ought to be some requirement of consistency in the outcome. Compare this year's report to 2010's, 2011's, 2012's, 2013's and 2014's for example. 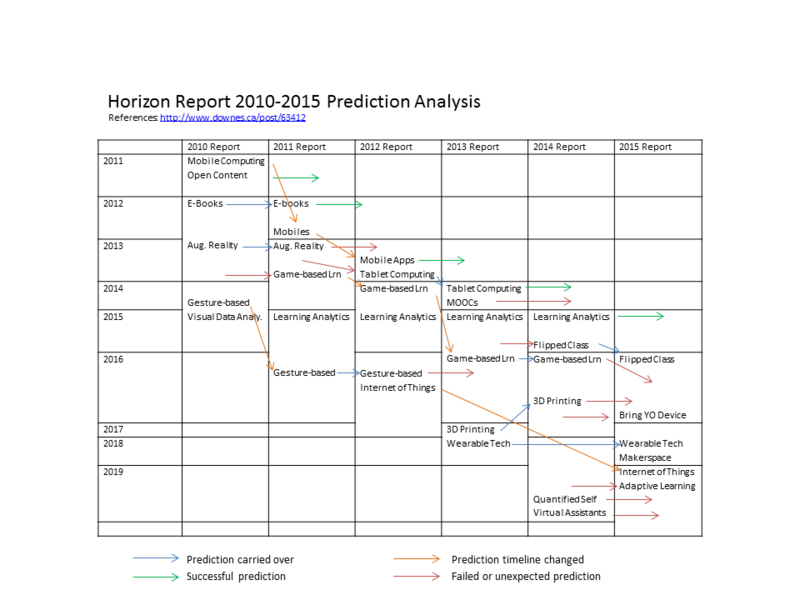 Games and gamification appear in the 2-3 year horizon for each of the four previous reports. This year it drops off the grid. So what happened? We see games listed as among the significant challenges in "blending formal and informal learning". But no hint of an explanation of why previous predictions came to naught. Meanwhile, we have 'bring your own device' in the 1 year range this year, which popped up out of nowhere, not appearing in any of the previous reports. How could they have missed it (especially when 2011 predicted 'mobiles' in the 1-year time frame)? So what does it tell us about the methodology? Mostly, that it sways in the breeze. It's strongly influenced by the popular press and marketing campaigns. It's not based on a deep knowledge significant technology developments, but rather focuses on surface-level chatter and opinion. And that is why I think NMC should be obligated to re-examine its methodology.